PEMA CHODRON IS MY LATEST HERO. My husband swears I am the last book I read, and I am a sponge, I'll admit. Sometimes, though, a writer will really get me where I live. 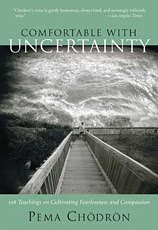 I picked up Chodron's "Comfortable With Uncertainty" about a year and a half ago, because, well, I wasn't, and frankly, I'm still a bit UNcomfortable with things that are uncertain. This gem of a meditation book is teaching me (again) that everything is uncertain. You know the saying: We plan, God laughs? Chodron expands upon that and many other ideas, thoughts, and teachings in her slender paperback. "But when we apply the instruction to be soft and nonjudgmental to whatever we see at this very moment, the embarrassing reflection in the mirror becomes our friend. We soften further and lighten up more, because we know it's the only way we can continue to work with others and be of any benefit in the world. This is the beginning of growing up." Sometimes I beat myself up for being sensitive, and sometimes people point out my kindness ("You're too nice") as if it is a character defect. It is uncomfortable at times, and it hurts, too, but more often I can see it as the gift it mostly is. My hope is that it will continue to help me to work with others in a nonjudgmental and loving way. 7 weeks to go, but who's counting? Who Is Attending CSWE Next Month?